Other than posting about Civil War Memory and Digital History, I don’t often post about another period of American history that interests me a great deal… the colonial era through the American Revolution. However, in keeping in touch with the base theme of Civil War memory of this blog, it seems appropriate enough to make a little comparison with historical memory of the American Revolution. In fact, on my most recent trip to New England and upstate New York, that’s exactly what I did. Actually, I couldn’t help but begin to think about the differences. I thought about them first along the Battle Road and Old North Bridge near Concord, Mass. However, I thought about them even more at Saratoga, New York. In fact, the personal connection with Saratoga was even greater… because I had family present at the battle. Pennsylvania Line, at least two ancestors served as “Hessians” in the Hesse-Hanau Erbprinz Regiment. The regiment was in North American just over a year by the time of the battle at Saratoga (actually, the second battle of Saratoga, otherwise known as the Battle of Bemis Heights), having been with Gen. Burgoyne’s advance out of Quebec and south along Lake Champlain. However, the “legacy” of my Hessian ancestors (and for that matter, any of my Rev War ancestors) was not something that was passed along in family stories. 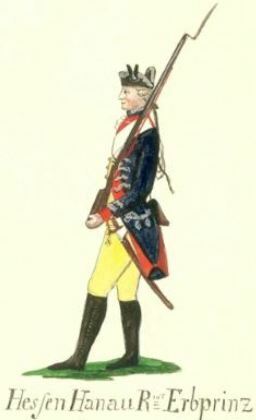 What the uniform looked like... this is from a set of watercolors done by Captain Friedrich Konstantin von Germann, commanding officer of Company 4, Hesse-Hanau Erbprinz Regiment. Fortunately, among the other sketches, he took time to capture the image of the uniform of his own unit. Then, just over two years ago, I tapped into some great resources and realized that Christian served in the Hesse-Hanau Erbrinz Regiment, having enlisted in Germany in February 1776. I soon realized that he probably did not see much action, even though he was in Burgoyne’s campaign, which ended in surrender only days after the Battle of Saratoga. My guess was he probably didn’t even get to fire his flintlock (and, when I visited Saratoga, my guess was pretty much confirmed… the regiment having spent most of the campaign guarding the artillery and supply train). Nonetheless, being on the same ground upon which he stood, while the fighting waged in nearby fields, was still a thrill. Following the surrender, Strohl spent time in Cambridge, Mass. (held at either Prospect Hill or Winter Hill), followed by a time at the barracks in Charlottesville, Virginia (Albemarle Barracks); Frederick, Maryland, and finally, Reading, Pennsylvania. Experiencing some horrible conditions by this time, he offered himself up for indenture, and his indentured was purchase by Michael Kiser on September 11, 1782. Like Strohl, Kiser himself was a native of Rumpenheim, having been born there, likely a son of Valentine and Maria Eppart Kiser. Kiser had left Germany in 1750 (nearly 26 years before Strohl took the boat ride across). Kiser was also a veteran of the American Revolution, having served in Capt. Philip Krick’s 8th Company, Fourth Battalion, Pennsylvania Line (possibly militia). Kiser’s name appears on a list of fines assessed in the years 1777-1778 for being absent from muster or drill. Interestingly, the purchase of Strohl’s indenture by Kiser may not have been purely coincidence as the Reformed Lutheran church records from Rumpenheim show that the Kayser and Strohl families lived near each other, attended the same church, intermarried, and witnessed each other’s baptisms. The Strohl/Strole birth and baptism certificate shows that Christian Strole was confirmed at this church in Rumpenheim in the spring of 1772. There may be a remote possibility that Kiser purchased Strohl’s indenture and subsequently freed him because their families were closely linked in Germany. Nevertheless, not long after purchasing Strohl’s indenture, sometime in 1783, the Kiser family, having purchased 1030 acres of land along the south fork of the Shenandoah River in what was then Rockingham County, Virginia, left Berks County, Pennsylvania for Virginia (the part of the state that is now Page County). Strohl, still being bound by his three year indenture, accompanied the Kiser family. On September 7, 1785, days before the expiration of his indenture, Christian Strohl/Strole purchased from Martin Strickler, 300 acres of land between the Shenandoah River and Peaked Mountain (in what was then Rockingham County, Virginia, and is now Page County). The home which he soon after built still stands today. On April 8, 1788, just over five years since Christian had been indentured to the Kiser family, he married Kiser’s daughter, Elizabeth. In all, Christian and Elizabeth had fourteen children between 1789 and 1814. Short end of it… it just seems interesting how the family’s memory of the American Revolution (whether it be the memory of relatives in the State Line or in the Hessian army) had nearly faded into oblivion by the time my generation came along. Quite honestly, other than a few bits and pieces that have managed to linger over the years, the family memory of the Civil War isn’t much better. Incidentally, the other Hessian ancestor (at least it seems quite possible at this point) was Peter Weiggert/Weygand (later changed to “Wyant”). Like Strohl, Weiggert belonged to the Hesse-Hanau Regiment and was among those surrendered shortly after the battle of Saratoga. However, unlike Strohl, Peter “Wyant” “deserted” (I know, it’s confusing to explain, but… yes, he deserted… while a prisoner of war. See Wikipedia’s definition of the Convention Army for a better understanding) from the Hessian Barracks (aka Albemarle Barracks) at Charlottesville on February 23, 1781, and apparently assimilated well into the population in the area. Interesting read on your hessian ancestor, Christian Strohl, I have done quite a bit of research on the Strohl (Strole) family as my wife (maiden name Strole) is also a descendant. I look forward to reading through your blog. Wish I could offer more family information through my blog postings, but more focused Civil War-related topics here. I am quite familiar with the Strole family; which of Christian Strohl’s children is your wife descended from? Christian’s son John (1791 – 1868), who married Drusilla Graves, then as it goes – Jacob Perry Strole married to Mary Jane Whitesell, Jacob Perry Strole Jr. married to Hester Ann Holdaway, Arthur Curtis Strole married to Clara Mae Saylor, Aurthur Kirby Strole married to Nancy Lee Hall (my wife’s father and mother). One of the areas I have researched is the Strole involvement in the Civil War but have been unable to find out much if any information relative to the family’s participation or not in the war. I thought Jacob Perry Strole married Pamily Ann Kibler. Jacob Perry Strole (b- 3/12/1838 d-2/24/1879) married Mary Jane Whitesell in 1862. His son Jacob Perry Jr. (b-3/12/1863 d-5/5/1938) married Hester Holdaway in 1884. Jacob Strole (b-1789 d-1860) son of Christian Strole, married a woman named Kibler. The Jacob Strole I am referring to was the son of John Strole (b-1791 d-1868) who also was a son of Christian Strole, and brother of the original Jacob Strole. It appears John Strole named one of his sons after his brother Jacob. I have some pretty detailed records, assume you have same, however if you want copies of anything just send me an email. “Huffman”?? Uh oh. We’ve been trying to find information on our Huffman ancestors. This requires some investigation. Since you are from down in the Roanoke Valley end, it may be a different run (or not) of Huffmans, especially since there was a particularly large pocket of 18th century German settlers in that area. If you find that your Huffman line actually leads into the Shenandoah, let me know. Thanks for posting this information. All I’ve had to go on is from Kathryn (Foltz) Layman’s The Christian Strohl History, 1776 – 1983, and Mark Arslan’s research and Judy Campbell’s Page County research. Pamily Ann Kibler, d/o Joseph Kibler & Martha Koontz, married James Perry Strole, s/o George Strole & Eve/Eva C. Jordon. Jacob Strole, son of Christian, married Eva Catherine Kibler, d/o Philip Kibler & Catherine Snyder. As another descendant of Christian Martin Strohl/Strole, I also have been working on my family tree. It’s always confusing when children are named after siblings or other family members. Do you have more information about Peter Wyant? I am trying to figure out who the parents of James Weiant (whose children became Wyant) are. He was born circa 1780 (died 1838 in Etobicoke, Upper Canada) James Weiant married Rachel Delong in Pittstown, NY sometimes 1796. He moved to Upper Canada in 1801. There is a family story that the ancestor Peter Wyant fought with Burgoyne’s army and that is why James eldest son was named Burgoyne. Any idea if this is true? “Rockingham County marriage records, as cited by Strickler, show that a Peter Wyant was the father of Catherine, Elizabeth, Susan, and Mary. The maiden name of these, his daughters, was consistently spelled Wyant. When Peter signed for surety, he signed in German, and his name was transcribed as Weyhant, Weygant and Weiggart. It’s a mystery I’ve been hoping to solve. I too am trying to find out the parents of James Wyant (Weiant) married to Rachel Delong. I am a direct descendant of Burgoyne, but have been unable to trace back beyond James. Any help would be appreciated. Just purchased the two books on the Page Courier articles. We are so glad they have been compiled for those of us so far away. I hope you have had an opportunity to see the “Carl Kayser Genealogical Site” by Mark R. Kiser for background on most Shenandoah Keyser/Kiser ancestors. They have nothing to do with Valentine Kiser’s line. I will be glad to scan some copies for anyone. That would be great! Thanks. I’ve never seen the house, and I’ve always been weary of trying to find the cemetery, usually because I never seem to find anyone on the property to get permission to check it out. Vicky, I am a descendant of Michael Kiser through his son Daniel. I would love to have copies of the Strole home and the graveyard. Michael Kiser may have been buried there. I am also trying to fine out if Michale Kiser’s homestead is still standing. Would you have any information on that? Thank you! I finally have the photo’s of Christian Strole’s home scanned in. How would I send these to you. Hello, just curious if images of the home built by Christian Martin Strole were every posted. CMS is my 4th GGF; I descend from his son John, then via daughters Jane, Fannie, Elta Mae, and Jean to me. Someday I plan to visit the Shenandoah River valley and historical sites. So are you related to the Peter Wyant who died 1838 in Rockingham County Virginia? I’m a descendant of Peter Wyant who died in 1838 through his son Peter Wyant Jr. born 1795 died 1886 Hinton Summers County West Virginia. There have been some who think that this Wyant doesn’t tie-in, but I think he does. If he does, yes… I’m a descendant. I am related to Peter Wyant who died in Hinton. Peter Wyant Jr. had Peter Burras Wyant….Peter Burras had Thomas Clay Wyant…who was father of Elizabeth Gertrude Wyant Vaughan (my Grandmother) Are you kin to Patsy or Susie Wiseman? Do you know who Peter Wyant,’s daughter, Mary married? No, sorry, Anna. I only traced my part of the line from his daughter Millie. Christian Strole was my five-times-great grandfather and I live on the Strole Farm property which includes the Strole cemetery. Does anyone have a picture of Christian or Elizabeth Strole? Sorry… no photos of which I’m aware. Christian Strohl is my 5th great grandfather on my Dad’s side (his mother). We live up near Champaign, Illinois. I am just getting in to the ancestory scene and traced it back to him. Any information dating back further than Johann Strohl would be much appreciated if you have that. Hi Michael, Please see his Find-a-Grave page. I wrote the bio sketch on Strole/Strohl which appears there. It provides info about his parents and possible siblings. I am a descendant of Michael Kiser through his son Daniel. Daniel changed the spelling of Kiser to Keiser and he eventually settled in Augusta County. I would love to be able to find out if Michale Kiser’s homestead still stands. Would anyone have any information? My father came from Wise Co. but we moved from Russell about 1895 when my grandfather or great-grandfather (?) James Taze (?) Kiser started working in the Sheriff’s Department, taking along Pappaw Abednigo, who spent some time in the Confederate service. I believe we came from Kiser, renamed Carbo in 1917, at Kiser’s Bend on the Clinch River. Kiser’s Bend is one of the biggest pieces of flat ground on the Appalachian Plateau, hidden about three ridges back in the mountains. Daddy – James Cecil Kiser, b. 1918 – always said we came from an escaped Hessian soldier. Other families with this story are Jessees and Rasnakes. Thought there was a Virginia historical marker with other names, but not seeing it. A leaf on this tree from the Strole side of my family. Hi my name is Jacob Strole. I am related to Christian Strole (Strohl) as well. My dad has got that same book you guys were talking about. At one time there was a second edition out but we didn’t purchase it. We were tryin to find out if anyone has any info on the second edition cause we would like to purchase it now. So if anyone has any info on how to purchase it please let me know. We would also like to get in contact with someone that still lives in or around Page County, Virginia where Christian settled cause we heard there is a cemetery there we would like to visit the area to see what it’s like. Or any other info would be great. Thanks. You can email me at JMSlastof4@aol.com. Please put in the subject line Strole family tree or something like that do I know what it’s about. I just came across this page while searching for my 6th great grandfather Peter Wyant. Hello too all my ‘cousins’ and thank you for this page!!!!! Jan 26, 2004.) 21 Mar 1820 in Orange County, Virginia, daughter of PETER WYANT and MILLY MARTIN. She was born 1799 in Rockingham County, Virginia (Source: OneWorldTreeSM. ), and died Aft. 1920.